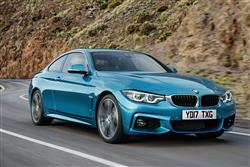 BMW's 4 Series Coupe is most popular in its four cylinder diesel 420d guise. Jonathan Crouch drives one to find out why. BMW's 4 Series Coupe must face newer rivals in the mid-sized sports coupe segment but it's up for the fight, especially in this usefully revised guise. The rear-driven handling dynamics are still class-leading and have been usefully improved. Plus they're now matched to extra technology and a more powerful road presence. Potentially, this is everything you'd want in a car of this kind. Especially in volume 420d diesel form. This is the sort of car BMW has always done very well, a mid-sized rear-driven performance-orientated coupe with perfect weight distribution and a purposeful demeanour. It all made plenty of sense when the Munich maker first launched this 4 Series Coupe model back in 2013 - which means that this improved facelifted version ought to be even more appealing. This 2-door 4 Series gets revised styling, an upgraded cabin, extra technology and an improved specification. Perhaps more significantly, there are dynamic changes too - a much more responsive steering system and a revamped suspension set-up that's said to enhance this car's handling capability without damaging its ride comfort. It all sounds quite promising doesn't it? Time to put this car to the test in 420d diesel guise. This 4 Series Coupe builds on a familiar basic winning Bavarian formula. Rivals have tried to copy the front engine, rear wheel drive BMW layout with its near perfect 50:50 weight distribution - but never quite managed to deliver a package with the same kind of involving finesse. This car shares many of its fundamentals with the Munich maker's 3 Series model, but has a lower ride height that comes courtesy of a wider front and rear track, hunkering the body better down into the road and lowering its centre of gravity. It helps that feedback from the tactile, pleasantly chunky three-spoke sports steering wheel is far better than you fear an electric steering system might offer - or at least it is in this revised model. Steering is one of the things that the engineers focused on most in updating this facelifted 4 Series and their efforts seem to have paid off, weight through the helm now building in a way that makes it easier to take every corner with just one fluid sweep of the wheel. The suspension has also been revised, the standard passive set-up now firmer than before. That may increase take-up this time round of the 'Adaptive M Sport Suspension' variable damping set-up we'd recommend. As with the original version of this car, a 'Drive Performance Control' system tweaks response from the throttle, the steering and the optional 8-speed auto gearbox to suit the way you want to drive. Engine-wise, most buyers choose one of the base 2.0-litre variants, either the 184bhp 420i petrol model or the 190bhp 420d diesel we're looking at here, a variant capable of 62mph from rest in 7.3s on the way to a top speed of just under 150mph. This two-door 4 Series has all the predictable BMW coupe design elements we've seen so often over the years - the short overhangs, the long bonnet, the set-back passenger compartment, the shallow frameless side windows leading into the signature Hofmeister kink on each C-pillar and a flowing roofline that offers up a low, stretched silhouette. It's a true sportscar profile that's here been... re-interpreted a little. You won't really appreciate just how much unless you happen to be super-familiar with the original version of this car, but just in case you are, we'll cover off the changes, most of which are found at the front. The unbroken central air intake is the main visual update. Inside, as with obvious rivals, you're treated to one of those 'belt butlers', an electrically-extending arm that (rather slowly) hands you your belt buckle once you get in. The driving position's lower-set than it would be in the kind of more ordinary 3 Series model that shares most of its engineering with this car. And you get a re-designed leather-wrapped sports steering wheel that now feels even better to hold. Getting into the back isn't the easiest task in the world, but it's aided by electrically-operable front seats. Once you're inside, you'll find a slightly strange combination of surprisingly decent legroom but slightly compromised headroom. In the boot, you get a large but shallow 445-litre space. Prices for 420d Coupe models start at around £35,600 and there are now just two trim levels, with most buyers likely to want to find the £1,350 premium necessary to graduate up from standard 'Sport'-spec to the racier-looking 'M Sport' level of trim. You'll be offered the option of xDrive 4WD if you want it - at an extra cost of £1,500. Sport automatic transmission costs around £1,700 more. As for equipment, well the base 'Sport' model comes with 18-inch Double Spoke alloy wheels, front and rear 'Park Distance Control' parking sensors, auto headlamps and wipers and full-LED technology for the headlights, the tail lamps and the front fog lamps. Inside, buyers get Dakota leather upholstery, heated front sports seats, a red-stitched leather 'Sport' multi-function steering wheel, two-zone climate control, ambient lighting, cruise control, an auto-dimming rear view mirror and a trip computer. As well as BMW's 'Drive Performance Control' set-up that enables you to tweak steering and throttle response to your mood. You'll want to know about infotainment too. All 4 Series models come with the usual BMW iDrive system that in standard form features a 6.5-inch colour screen, Bluetooth with audio streaming, Navigation and a decent quality six-speaker DAB stereo. The 4 Series may be predictably pricey to buy but it's surprisingly affordable to run. BMW's EfficientDynamics technology is standard, helping the car achieve economy and emissions levels that belie the kind of performance that's on offer. The latest car looks a very strong contender with ultra-competitive economy and emissions figures. The 420d is the frugality champion in its line-up, managing 62.8mpg on the combined cycle and 119g/km. The other big ownership cost with a car of this kind lies with depreciation, something that can often be easily forgotten about in the excitement of ordering a new car. With the BMW, you're on very safe ground as this 4 Series Coupe always has a willing line of used buyers keen to snap it up on the secondhand market. This means used prices are strong, so for a 420d, you can expect a retained worth of about 45% after three years and 60,000 miles. What else? Insurance groupings? This 420d is rated at group 31 or 32. And finally? Well there's the usual three year / 60,000 mile warranty - and that's extendable at extra cost upon request. So is this BMW 4 Series Coupe still the car in this class that does it all, the sector benchmark, the go-to choice in its segment? If you're the kind of driving enthusiast this model has traditionally appealed to, the answer's probably yes. Can it be criticised? Perhaps. Some have found it a rather overly mature proposition, but we think that these are people who would probably be better suited by BMW's smaller 2 Series two-door model. What's not up for debate is that here, BMW has built a benchmark contender in this class, especially in this 420d guise. That sounds rather clinical doesn't it, so let's allow the Munich maker's marketing men to have the last word. This car, they say, is more than just a 'love letter to performance'. Instead, it offers something deeper than that: the promise of a passionate affair.